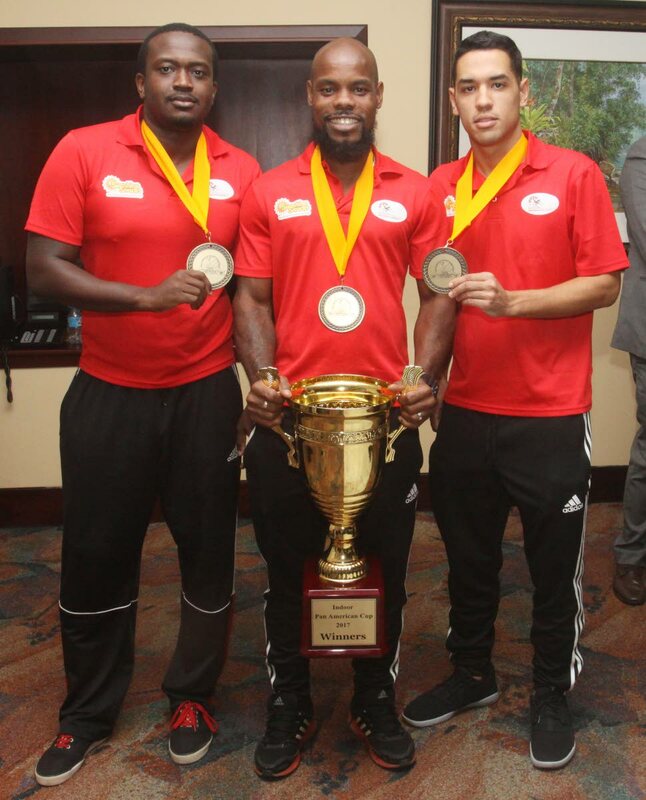 Trinidad and Tobago hockey goalkeeper Ron Alexander, left, Solomon Eccles, centre, and top scorer Jordan Vierra, pose with the Pan Am Indoor Cup at the VIP Lounge, Piarco International Airport, yesterday. Sports Minister Darryl Smith has promised to assist the Trinidad and Tobago men’s hockey team as they turn their focus towards the 2018 Indoor Hockey World Cup in Berlin, Germany. At the 2017 Indoor Pan Am Hockey Cup in Georgetown, Guyana, Trinidad and Tobago men’s team finished the round-robin stage with a 100-percent record – defeating Argentina 5-2 (last Monday), hosts Guyana 4-0 (last Tuesday), Barbados 8-2 (Wednesday), Mexico 13-2 (Thursday) and Canada 7-5 (Friday). And, in the title match on Saturday, the TT squad hammered the Argentines 7-0 to book their tickets to the World Cup. Both the national men’s and women’s teams returned home from Guyana yesterday, and were treated to a brief welcome reception at the VIP Lounge, Piarco International Airport. The women’s team finished fifth overall, as the United States earned a berth at Germany, but the spotlight was on the men’s team who reached the Indoor World Cup for just the second time. Smith admitted difficulty with regards to the importation of a new astro-turf from the United States for the National Hockey Centre in Tacarigua. The Minister said, “It’s tough times now, resources are limited so we have to ensure that we get the (value) for our buck. But we’re here to support and work with you all. There are plans to have the team engage in a couple overseas tours, in preparation for the Indoor World Cup. Also speaking at the event were national women’s team skipper Alanna Lewis and Roger St Rose, first vice-president of the Trinidad and Tobago Hockey Board (TTHB). Reply to "Smith urges corporate TT to support Berlin World Cup campaign"